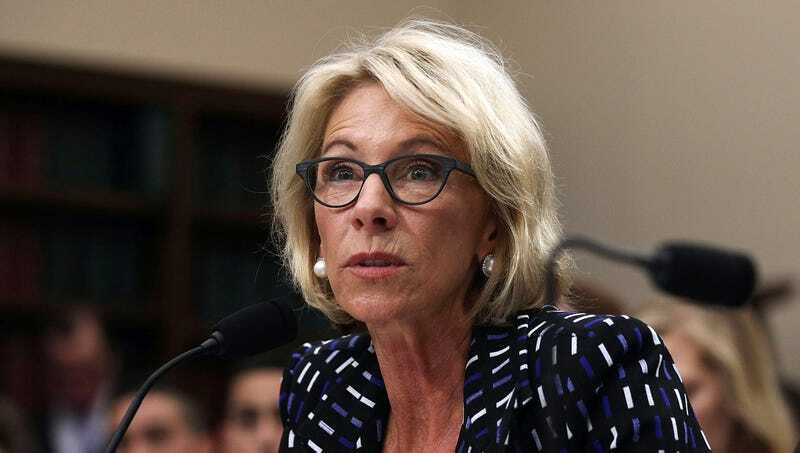 WASHINGTON—Explaining that there was no one-size-fits-all solution to the problem, Secretary of Education Betsy DeVos reportedly argued Monday that the issue of guns in schools should be fully left up to the individual shooters. “It’s not the role of the federal government to step in and dictate whether firearms in the classroom are the right choice for any one specific shooter,” said DeVos, who told reporters that every shooter is different and that it should be in their hands to decide how much training they need and what sort of weapon they should carry. “It makes sense that a shooter in rural Iowa is going to require a different setup than a shooter in the middle of Atlanta. Instead of trying to solve this with an overly broad and ineffective mandate, we need to be making decisions on a shooter-by-shooter basis.” DeVos added that she believes strongly in this policy, as it has already proven successful with shooters across the country.